TRANSMISSION CORPORATION OF ANDHRA PRADESH LIMITED, Is Appointing Eligible People To The Post Of Assistant Engineer (Electrical), So Interested People Can Apply For This Job Through Online Mode, Within The Given Time Period. Assistant Engineer (Electrical) →171 Vacancies, Kindly Do Check Out The Image Below For Vacancies Distinction And More. B. Eligible Criteria For Assistant Engineer Job Vacancy In APTRANSCO Recruitment 2019. Age Limit →Shall not be more than 42 years as on 01.02.2019 Upper age limit will be relaxed up to 5 years in respect of SC/ST/BC candidates and up to 10 years in respect of P.H candidates..
Educational Qualifications →Assistant Executive Engineers/Electrical: Must possess BE/B.Tech/ A.M.I.E, Electrical & Electronics Engineering or equivalent qualification in the similar discipline from any recognized University in India on regular basis as on 01.02.2019. Online Application/Examination Fee→Each applicant must pay Rs.150/- (Rupees one Hundred and fifty only) towards Application Processing Fee. i) Applicants under General category must also pay RS.350/- (Rupees three Hundred and fifty only) towards Examination Fee. (Applicants belonging to SC/ST/BC Communities and PH need not pay this fee). ii) Candidates belonging to States other than Andhra Pradesh will be considered in general category only and are required to pay the above- prescribed fee. Download Admit Card/Hall Ticket →The hall tickets will be placed on the website seven days prior to the date of examination. The candidate has to down load the Hall ticket from the website only. Hall tickets will not be sent to the candidates by post. Tentative Examination Date →The written examination for recruitment of Assistant Executive Engineer (Elecl.,) will be held on 19.05.2019 at 10.00AM to 12 noon. 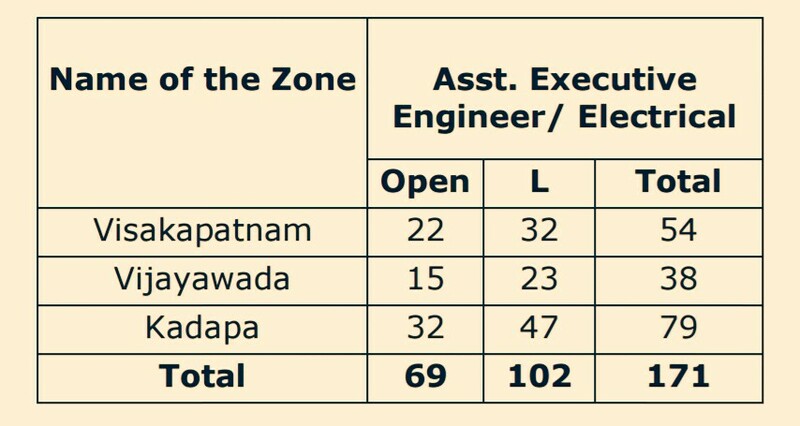 Examination Centre →The written examination for recruitment of Assistant Executive Engineer/ Elecl., will be held at different centers located in Vijayawada and Guntur. Now Apply For AE Job Vacancy In APTRANSCO 2019.